D. C. Taylor Co. is a roofing contractor with more than six decades of experience servicing commercial and industrial properties. They have the knowledge and capabilities to help with roofing repairs, installation, and maintenance. In need of a new site D. C. Taylor Co. reached out to Creative Mellen to develop a robust site that could focus on their services, process, careers, and history. Getting information to the user quickly was a key factor in how we structured D. C. Taylor’s award-winning website. We created a services page highlighting the main services in a simple visual slider. Other services are then listed in a expandable menu, which allowed the user to go to one page, see an overview, and get full details with an easy click. 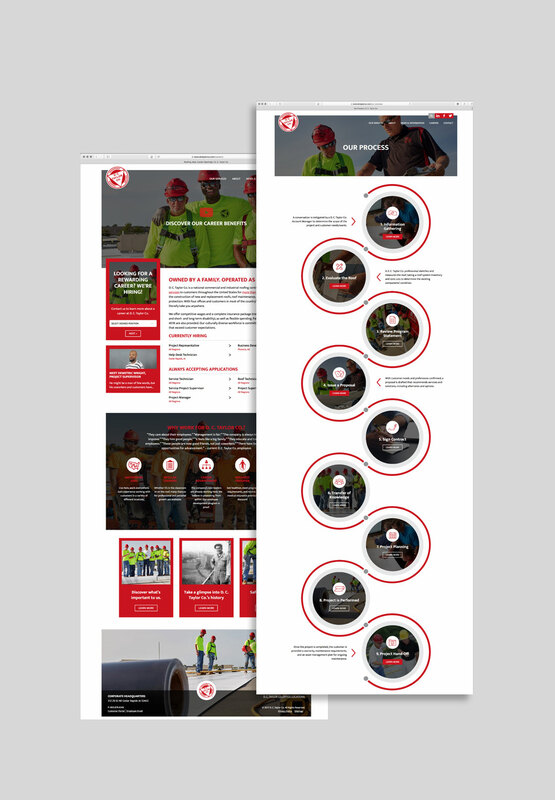 To educate potential customers on the process for repair and maintenance, we developed a scrolling, animated infographic with easy-to-understand information shared in a step-by-step process. To promote and capture leads for new hires, we developed a robust career section that features video, iconography highlighting benefits, and access to a custom online application. To illustrate their rich history, we also created a custom scrolling timeline for easy navigation between years both on desktop and mobile. To create interest and encourage further exploration, we featured a homepage video, rotating profile spotlights, large visual call-to-actions, and an interactive contact map.